The hotel nestles at the waters edge overlooking some of the most beautiful sea and coastal views in the world. It's six acres of ground lead into the Berry Head Country Park, which was once part of the estate and is designated an area of special scientific interest and is now owned by the National Trust. 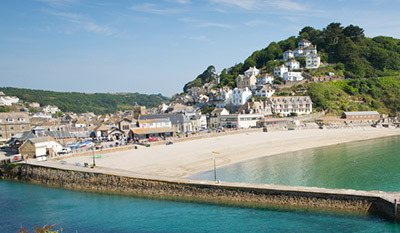 If you enjoy walking, you can follow the miles of coastal paths along the dramatic and unspoiled coastline to the River Dart and beyond, with its small coves, rare wild flowers and a multitude of seabirds which find sanctuary in the cliffs. The historic fishing port of Brixham is a short walk from the hotel, scene of the arrival in England of William Prince of Orange in 1688, the town retains the charm of a bygone age around the harbour with its narrow streets, quayside and fishing fleet. The hustle and bustle of the fish market and the arrival and departure of the boats create a unique atmosphere and backdrop to your visit. Food, relaxation and comfort is the theme at Berry Head. A Devon cream tea on the terrace watching the trawlers entering port laden with their catch....an informal drink followed by a meal in the bar where many a seafaring tale is spun....a more formal dinner in Bonapartes Restaurant, where a varied a la carte menu awaits you complemented by interesting wines, as the sun sets over the bay. The elegant Mulberry Room which opens out to secluded walled gardens provides the perfect setting for weddings and special occasions. And so to bed and the gentle lap of wave on rock. Our bedrooms are all en-suite and furnished with personal care. All offer remote colour TV, tea and coffee making facilities, telephone and hairdryers, the majority provide magnificent views of Torbay and beyond. Whether sailing, walking, angling or simply relaxing, the Berry Head is an idyllic haven in a busy world, offering a warmth, friendliness and personal touch that can only be found in a privately owned hotel. The hotel grounds have a magical air and tranquillity and include early nineteenth century gardens with examples of herbs and plants originally from the Mediterranean. There is a petanque court, a croquet lawn together with an indoor swimming pool, spa bath and exercise area.